the first 10 Minutes on the bezel are subdivided in single minutes. the room between the case and bezel. For the bezel to be turned, it must first be pressed down. Discover this cool, colorful diver's watch from 1968 - Zodiac Super Sea Wolf. Although this is a vintage watch from the 1960s, it has a quite modern look. Colorful dial configuration, large oval case and beautiful stainless steel flex bracelet give a unique overall look to this watch. The intense orange color of the minute hand and the hour markers improve the readability during the dive and is a trademark of the Super Sea Wolf. The tritium lume is just impressive. It is original, completely intact in all elements and still shines under UV light. The black dial is in perfect condition. It shows decompression tables to aid the wearer when diving. The stainless steel case has an oval shape. Despite its large dimensions (44x50mm), the Zodiac Super Sea Wolf looks very nice and attractive on the wrist and is comfortable to wear. The case is unpolished and the serial number is still deeply engraved on the case back. The rotatable bezel has a very interesting construction. For the bezel to be turned, it must first be pressed down. There is a room between the case and bezel. Thus, an unintentional adjustment of the bezel under water could be avoided. The rotatable bezel has a Bakelite insert. The first 10 Minutes on the bezel are highlighted and subdivided in single minutes. The heart of the Zodiac Super Sea Wolf is the in-house automatic caliber 134 with a quickset date. This helpful complication was an absolute rarity back in the late 1960s. The movement has been checked and works perfectly. Another highlight of this offer is the original Beads of Rice Flex bracelet. It has 4 stretchable links and a special diving clasp. The clasp has a sophisticated diver's extension, which can be expanded quickly with a small lever. Thus, the watch could be worn over the diving suit. The bracelet is in mint condition. No wonder these beautiful vintage bracelets are so rare and in demand today. 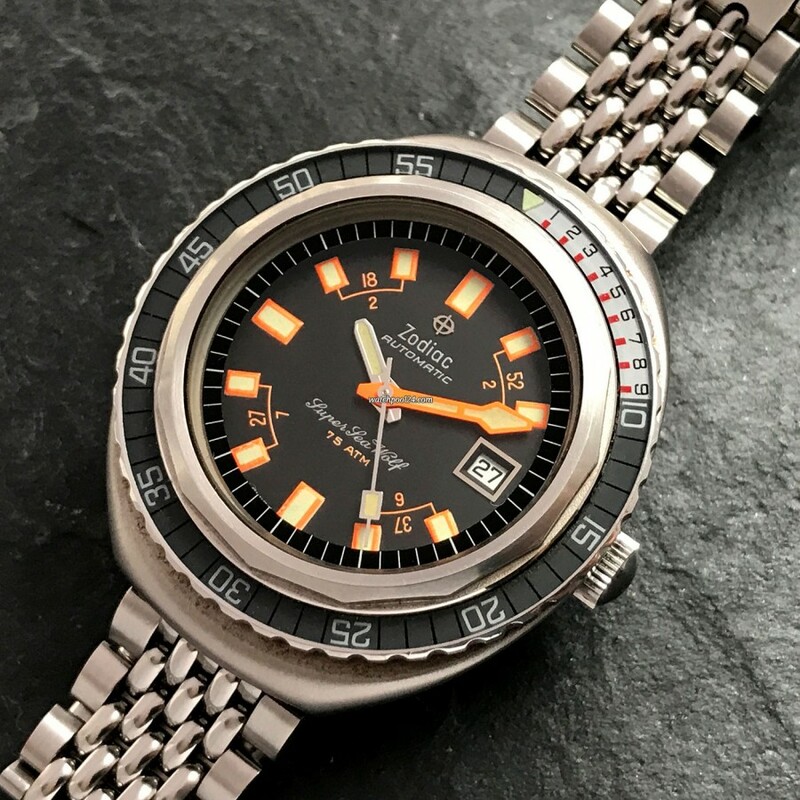 The Vintage Zodiac Super Sea Wolf is a cool outdoor leisure watch with a striking look and a huge recognition factor. The excellent condition of this specimen is impressive and extremely rare.